Get the latest iPhone updates, iOS apps, themes, wallpapers, games, iTunes, reviews and unlocking tips. Apple’s new iOS 7 operating system is here and so are the new iPhones. Mailbox: An email app that treats you inbox as a to-do list. Redesigned for iOS 7 (and only compatible now with iOS 7), it has been “flattened” and streamlined for the new interface. 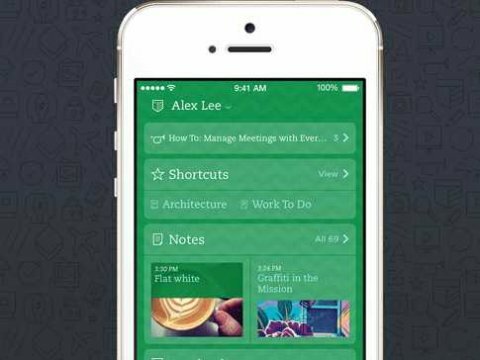 Evernote: The popular note-taking app has been totally redesigned for iOS 7. New iOS 7 features include AirDrop note sharing, dynamic sections that sow up when you use them and vanish when you don’t, improved image annotations and faster syncing. Collaborate: A project manager app for work groups. Track tasks, set deadlines, share files via services like Box, Dropbox, Evernote, Google Drive. The iOS 7 version also let’s you send private messages via AirDrop. Google Drive: Like previous versions, the iOS 7 app, lets you edit and share Google docs, spreadsheets, and presentations. Skype: The popular video chat app is iOS 7-friendly. With the update, Skype lets you join group calls from your iPhone, plus improved video quality. Fantastical: The is a fast and easy to use calendar app that schedules meetings for you and takes dictations is just as easy to use on iOS 7. Note that the whole app hasn’t been upgraded, yet, viewing and managing Facebook events still requires iOS 6. Dropbox: The cloud storage app that will automatically backup your photos has been updated for iOS 7. But do check with your IT folks before installing this for work. Dropbox is also the app most likely to be blocked by enterprises and iOS 7 has new features for IT pros to manage apps on iPhones used for work. If IT says “no” to Dropbox, you might be better off waiting for the new Box Notes iOS 7 app from Box, which is currently in beta. It turns your Box account into an Evernote-like note taking app and lets you chat with the people you collaborate on documents. iOS 7 vs. Android 4.4 KitKat: Clash of Titans!